Sharper Edges: Women Working on the Edge of Glass at the Bergstrom-Mahler Museum of Glass features the work of female artists exploring social issues. 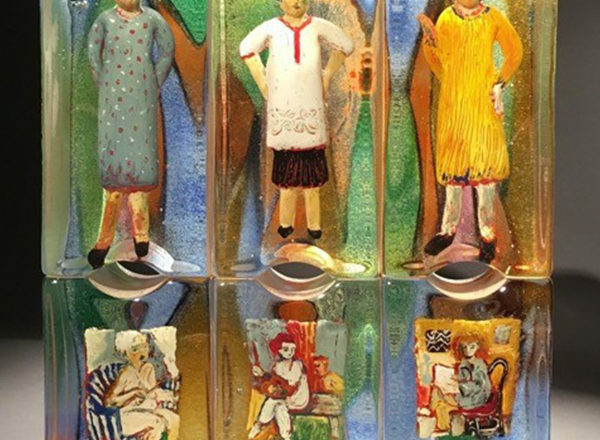 Incorporated into glass sculpture, the women express distinct viewpoints on politics, gender biases, stereotypes, consumerism and the environment. Women are a formidable force in the growth of contemporary studio glass despite the challenges they face receiving the same level of recognition their male counterparts enjoy. This exhibit examines select female artists speaking with distinct viewpoints on social issues. Contemporary artists whose work is on view include Audrey Handler, Susan Taylor Glasgow, Beth Lipman, Lisa Koch, Stephanie Trenchard of Popelka Trenchard Glass in Sturgeon Bay, Carmen Lozar, Kristin Thielking, Deanna Clayton of D.C. Studios of Sister Bay, Lisa Beth Robinson and Jennifer Caldwell. Handler is one of the first female students in the University of Wisconsin-Madison Glass Program under Harvey Littleton and a founding member of the Glass Art Society. The show will honor her and her work as a separate focus during this time. Bergstrom-Mahler, located at 165 N. Park Ave. in Neenah, is open 10 am-4:30 pm Tuesday through Saturday, 1-4:30 pm Sunday and 10 am-7 pm on the third Thursday of the month. The museum is closed on Monday. Sharper Edges runs through Feb. 17, 2019. For more information, visit bmmglass.com.